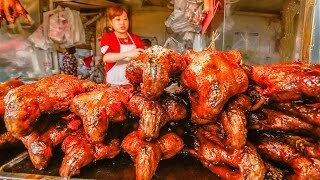 Chinese street food and Chinese Food in China is incredibly delicious! 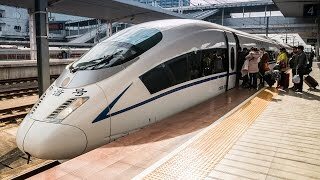 So I flew to Shanghai, China and have been eating street food, noodles, and dumplings non-stop. 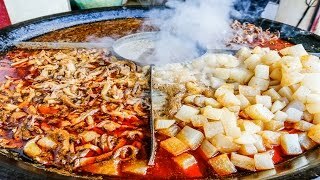 Best Street Food to try! The Chinese food is so good in Shanghai! I've eaten street food in Bejing, street food in Chengdu, street food in Xi’an, street food in Guangzhou, and now, street food in Shanghai. 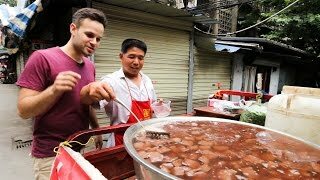 A lot of the street food in Shanghai is similar to other street food in China. 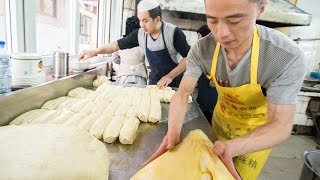 You can find some unique Shanghai street food specialties here, like xiaolongbao (soup dumplings), shengjianbao (pan fried dumplings), seafood on the street, and some delicious noodles as well. 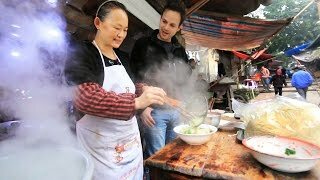 You can also enjoy countless other street foods in Shanghai, many featured in this video. 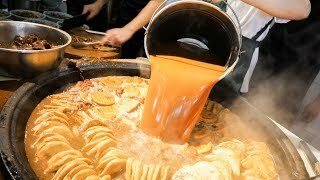 The street food in Shanghai was so delicious. The restaurant food and special Chinese cuisine was also very nice! 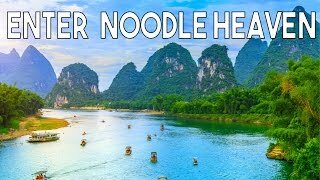 I had some amazing Chinese sesame paste noodles that were to die for! 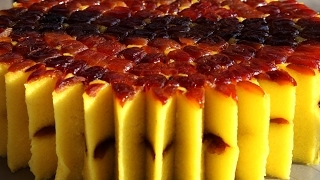 1) 00:34 Breakfast Street dà bǐng or shāobǐng, (大饼， 烧饼)- The “Big Cake” - served in sweet or salty versions. 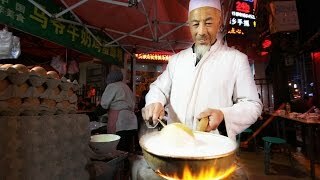 2) 02:00 The famous shāndōng jiānbing 山东煎饼, a famous snack/street food in China, kind of like a Chinese crepe. 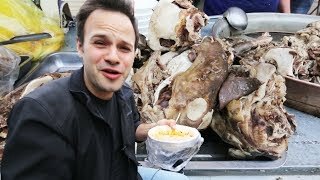 3) 03:00 Whole roast lamb 烤全羊 Kǎo quán yáng - Xinjiang style from the furthest west province of China. Address：You can find this huge market every Friday near Changde road. 5) 06:35 Sesame paste noodles - 麻酱面 - májiàng miàn, these were some of the best noodles I’ve ever had. Price: 10 RMB basic bowl plus extra spicy pork, pay around 25~30 RMB ($4.50) for a nice lunch. 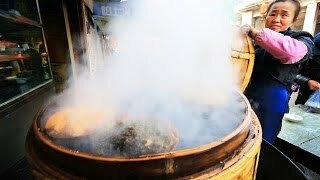 6) 08:25 Famous Shanghai Shēng jiān bāo 生煎包 - These are reason enough to come to Shanghai. 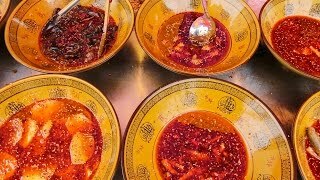 7) 10:44 Shanghai breakfast street food specialties - Chinese street food breakfast in Shanghai. 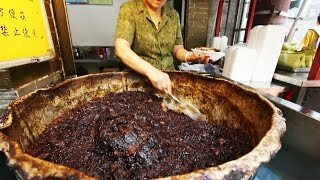 8) 14:20 Stewed pork made from the essence of fermented tofu (腐乳肉 fǔrǔ ròu), and a gluten dumpling (Dān dàng 单档) filled with juicy pork. Restaurant name and address: 上海文庙旁 Right beside the Wenmiao temple in Shanghai, down a back alley street where they sell lots of Anime and Manga. Price: 21 RMB ($3.15) for two. 9) 17:00 The final street feast of the night happened on the outskirts of Shanghai, where Xiaoyun brought me to try a Shanghai summer favourite, crayfish (小龙虾 xiǎo lóngxiā). 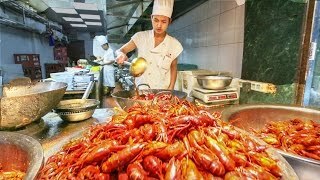 Price: Around 124 RMB ($18.58) for a couple huge plates of crab and crayfish with rice.